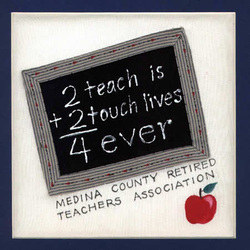 The Medina County Chapter Retired Teacher Association was organized in 1967 with a membership of fifty-one retired teachers. The Medina County Chapter RTA meets four times a year for business and pleasure. Retired teachers from the entire county are eligible to belong regardless of whether they taught in the area. When the retired teachers get together, one hears many stories concerning past experiences. Certification requirements make an interesting topic. Back in the early one-room school days, requirements for teaching were practically nil. The fact that married women were not permitted to teach is also remembered by some. The old county normal school furnished an opporutnity for many teachers to secure courses leading to meeting certification requirements. When the retired teachers of Medina County meet today, problems are discussed and legislative matters are brought before legislators. Friendships are maintained.